The Life and Death of Jeremy Bentham picks up on Locke's story after he was thrown off the Island. Like Ben before him he is deposited in Tunisia and is soon tracking down the members of the Oceanic Six with the help of the redoubtable Mr. Abbadon (The Wire's Lance Reddick making a return appearance). This is the episode that fills in the gaps and reveals how Locke ended up in the coffin at the end of Season 3. However, it is slightly unsatisfying. 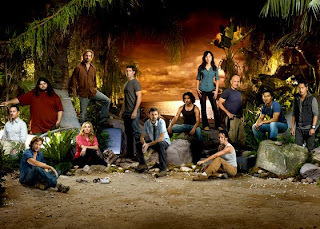 Whilst Jack and Hurley's reactions to Locke's request they return to the Island are in-character, Kate callously refusing to go back and help Sawyer and Sayid's indifference to the fate of the innocents on the Island are both unconvincing and seem to be plot devices to put Locke on the road to despair and the episode's shock ending (which is more successful in its unexpected brutality). LaFleur, on the other hand, is utterly brilliant. We start off seeing Sawyer, Juliet, Jin, Miles and Faraday on the Island after Locke disappeared down the well. The final time flash leaves them in permanently stuck in 1974, when the DHARMA Initiative is up and running at the height of its influence. With the group about to be thrown off the Island, it falls to some quick-talking by Sawyer (and his knowledge of the 'Hostiles') to convince the DHARMA folk to accept them in. Josh Holloway totally owns this episode and we see Sawyer get to deploy his formidable wits and intelligence in a way we haven't since some of his earlier conman flashbacks. The shift in the dynamic of the show at this point is entertaining to watch, as we get to know some of the members of the DHARMA Initiative and the knowledge that all of them - or at least those of them who are still on the Island in 1992 - are going to die adds an air of poignancy to proceedings. He's Our You follows up on the previous episode with the DHARMA guys torturing Sayid to find out what the Others are up to. There's some real tension here as it appears that Sayid might be about to blow Sawyer's gig. As with most Sayid-centric episodes, this is a winner centred on Naveen Andreas' reliably haunted performance and Sayid's actions in this episode, of a man at the end of his tether who never wanted to come back to the Island and whose life has no real meaning on or off it, are convincing, especially the jaw-dropping conclusion which is exceptionally cold, even for Sayid and even for this show. SF fans will no doubt enjoy a cameo by Blade Runner's William Sanderson as DHARMA's torturer-in-residence Oldham. Whatever Happened Happened addresses the apparently time-shattering events of the previous episode and is centred on a conversation about the show's time travel paradoxes by Hurley and Miles which seems to end in confusion until the episode's ending expands on events and seems to confirm Faraday's earlier assertion that "Whatever happened, happened". This episode is mostly centred on Kate, which is enough to strike terror into the hearts of even the most seasoned Lost fan, but it's one of the best ones in a long time, expanding on the backstory impressively. Kate's friendship with Cassidy and the reason she gives to Claire's mother for returning to the Island almost make her character likable again, which is something I thought was impossible by this point. Another winner. Dead is Dead focuses on some more of Ben's backstory. We learn how he kidnapped Alex as a young child (helped by the 11-year-old Ethan), how his rivalry with Charles Widmore grew over time (leading to the latter's banishment) and what happened when he went to unleash his vengeance for Alex's death on Penny. Ben is forced to conclude that he needs to atone for his sins and journeys to the Island's mysterious Temple to ask the Monster for judgement. Fans of the show's mysteries will no doubt be fascinated by our glimpses of the Temple, of the Monster's lair and of Ben's summoning system, although all of these raise numerous fresh questions. The story of the 'new' crash survivors from Flight 316 is also furthered and we get proof that these people are not what they seem either. A great episode really strengthened by Terry O'Quinn and Michael Emerson on top form as the new, super-confident Locke and Ben. I was worried if the time travel shenanigans at the start of the season were going to undo a lot of the headway Lost has made in late Season 3 and all of Season 4, but these fears proved unfounded. The show is still going from strength to strength. Glad to see another LaFleur fan - may favorite episode of the season and my #4 of all time.